I've been spending a lot of time jumping with my toddler kids lately. This action reminded me that jumping can be a great addition to a strength routine. 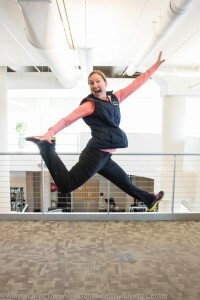 Did you know that jumping has been shown to keep bones strong and may even increase bone density? Try adding some jumping in to your workouts. Begin slowly if it’s been a long time since you were a child playing jump rope! Of course, as with any exercise, you will need to get your physician’s approval before adding jumping into your workouts. If you have osteoporosis or any other disease where jumping is contraindicated, please do not attempt the following suggestions. Try the following as part of a cardio workout or in between weight lifting sets. Jump rope legs (no jump rope needed) Start standing. Shift your weight from right to left. Now, add a little hop from right to left. Continue hopping from one foot to the other for 30 seconds. Repeat 3 times. Two footed mini jumps Jump off both your feet at the same time. Jump only a little bit off the ground. Pretend you are jumping over a jump rope. Two footed jumps Position yourself inside a doorway. Reach up and touch the top of the doorway frame by jumping off the ground. Count how many times you can touch the top within 30 seconds. Try to beat your number next time. Jump rope Be inspired by children by jumping rope in between strength exercises. Jump ropes are located on the band racks in the DAHLC fitness floor and track levels. Work up to 30 seconds at a time, repeat throughout strength workout. Here is something to help you get motivated! To find out more about bone density, including a screening for bone density, click here for information on the iDEXA. Babatunde OO, Forsyth JJ, Gidlow CJ. A meta-analysis of brief high-impact exercises for enhancing bone health in premenopausal women. Osteoporosis Int. 2012 Jan;23(1):109-19. doi: 10.1007/s00198-011-1801-0. Epub 2011 Sep 28. PubMed PMID: 21953474. Guadalupe-Grau A, Fuentes T, Guerra B, Calbet JA. Exercise and bone mass in adults. Sports Med. 2009;39(6):439-68. doi: 10.2165/00007256-200939060-00002. Review. PubMed PMID: 19453205.